One of the major risks you will probably face when it comes to your retirement is longevity. Longevity is the prospect of outliving your retirement resources and an important factor to consider when planning for retirement. So what can you do to reduce your chances of outliving your retirement resources? Keep in mind that a portion of your income may already come from regular monthly payments, such as Social Security or a traditional employer pension plan. You may consider using a portion of your other retirement and/or personal assets to purchase an annuity contract to supplement this income. No matter what type of annuity you choose, make sure you buy from a financially strong, reputable insurance company, and that you compare costs and benefits between policies. There is a very wide range of annuity products with many options to consider. An independent financial advisor (e.g. one who does not earn commissions, and who is not employed by the insurance company) should be able to help you evaluate various annuity options. For many people who are considering an annuity but who also want some inflation protection and asset growth, it makes sense to annuitize only a portion of their assets (e.g. with a fixed/life or joint & survivor annuity) and invest the rest in a mix of stocks and bonds. 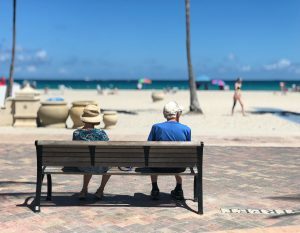 Mutual fund companies are beginning to offer funds designed to help retirees receive income in retirement for as long as they need it be mindful that these products are mutual funds and have no guarantees. Two examples of such offerings are the recent mutual funds introduced by Fidelity Investments and the Vanguard Group. The funds offered by Fidelity Investments are designed to withdraw from your account until the designated target date, at which point all principal and investment gains will be withdrawn. Monthly payments remain the same each calendar year, but will adjust at the beginning of each year, based on the investment performance and target date of the fund. The fund offered by The Vanguard Group is designed to generate regular monthly payments to help meet retirement expenses and to preserve retirement savings for future use. Annual distributions are adjusted each year based on a 4.0% withdrawal rate applied to an account value calculated using the investment performance over the past 3 years. You can buy a newer type of annuity contract from an insurance company that only pays monthly benefits once you reach some stated age, such as age 85. You would pay a lump sum premium when you purchase the contract. No benefits would be payable prior to the stated age. This material is provided for informational purposes only and is not to be construed as a recommendation, offer or solicitation to buy or sell a security or investment product. All information is subject to change without notice and there can be no assurance that any of the views or opinions expressed herein will come to pass. Certain statements, projections and forecasts are forward-looking and, due to various risk, uncertainties and other factors, actual outcomes may differ materially than those expectations portrayed herein. Investing involves risk, including the potential loss of principal, and past performance may not be indicative of future results. Conrad Siegel Investment Advisors, Inc. is an investment adviser registered with the U.S. Securities and Exchange Commission. For additional information, including our Form ADV disclosure documents, please consult the Investment Adviser Public Disclosure website at www.adviserinfo.sec.gov.